Baby Boomer Retirement: Retirement Housing for Aging Alone - Are You Prepared for the Future? Retirement Housing for Aging Alone - Are You Prepared for the Future? Millions of Americans are aging alone, often because they are divorced or widowed. Others may never have married. Large numbers of them may not have children, or their children may have their own physical, mental or addiction problems which make them unlikely to be of much help. Although most of us believe we will be able to take care of ourselves for the rest of our lives, this is not always realistic. What happens if you are diagnosed with a serious illness or dementia? Everyone needs to understand their options for aging alone, so they are prepared when the time comes and they need extra help. The first thing you need to realize is that few people really need to be totally alone, unless they are unwilling to reach out for help. Organizations such as your church or place of worship, the local senior center, and Meals on Wheels have resources to help you, whether you need permanent or temporary assistance, such as after a surgery. If you wish to remain in your own home as long as possible, contact the organizations mentioned above, as well as your nearest state Social Services department, and follow their suggestions. You may qualify for financial assistance, discounts on your utilities, special telephones for the hearing impaired, free or discounted transportation, Meals on Wheels delivered to your home, and handicapped accessible equipment to make it easier for you to live alone. For many people, these services make it possible for them to remain in their own home much longer than would otherwise have been possible. It is likely that there are also businesses in your community which will make it easier to stay in your own home as you age. Find out if you can get your groceries delivered, your cleaning picked-up, and a maid service to clean for you. Does your local transportation authority have buses or ride share services which will take you to shopping centers or doctors' appointments? Are you taking advantage of online banking? All of these conveniences make it easier to live alone, even when you have trouble getting around on your own. In addition, set up your own circle of friends and relatives who may be in the same situation. Create a phone circle so you regularly make phone calls and receive calls from others. In this way, you can help check on them and they can check on you. This can bring peace of mind in the event you fall or are injured, knowing someone will check on you and, if you do not respond, they will call a neighbor, relative or the police to do a wellness check. A friend of mine has a 90 year-old neighbor whom she worries about. Together they came up with a plan that the 90 year-old would open the blinds in her kitchen window by 10:00 every morning. When my friend sees the blinds have been opened, she knows her neighbor is OK. A simple plan such as this one can make it easier to live alone, while knowing that your neighbors are looking out for you. You can also use technology, such as a Great Call device or similar wearable alarm system, so you can easily reach someone in an emergency. You simply need to push a call button and the agent who answers can call a neighbor, friend, police or ambulance service for you, depending on the situation. You can even do something as simple as taking the time to make sure you always carry your cell phone around in your pocket. Finally, pull together a few social circles. These can be people who get together on a regular basis such as book clubs, quilting clubs, lunch pals, or dinner groups. Join a bridge group or take a class at a senior center or community college. Send cards or emails to friends and relatives so you stay in touch. All these social contacts can enrich your life and help you feel less alone, which is important for both your mental and physical health. Once you have exhausted all the programs which have enabled you to live on your own, what should you do when you eventually need more care than is possible for you to get in your own home? This is when you or a person you trust should plan ahead for the best type of housing for you. You need to consider the types of care you may need, the activities which interest you, the amount of socialization you think you would enjoy, and how close you want to be to your current community support such as your church, old friends and relatives. You can start by using a reputable agency to hire a personal caregiver. This may help you stay in your own home even longer. However, it is important that a friend or relative checks on the caregiver regularly, to make sure they are giving you appropriate care and not taking advantage of you. You may also consider moving into an over-55 community where you can live in a separate home of your own and participate in community activities, but have an added layer of security as well as the company of neighbors who are also aging in their own homes. Several of my friends have moved into a wide variety of special senior living facilities and wondered why they waited so long. 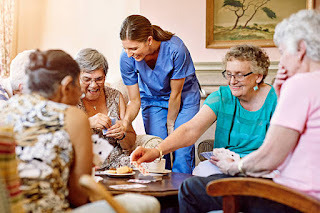 Modern assisted living communities have parties, cocktail hours, special events, classes, trips, pools, art studios, gyms and more, while providing meals, housekeeping and other types of care. Once they have gotten settled, most of my friends have loved their new homes! Personally, I am currently living in an over-55 independent living active adult community. I have plans to move in the next couple of years into senior apartments which include dinner, lunch and housekeeping, but no nursing care. In the event this is not enough care, I also have long-term care insurance so I can move into assisted living or a memory care facility when I get really old! However, I'm not in a hurry for that to happen and, perhaps, it never will. Independent Living Apartments: These are ideal for people who want the security and simplicity of living in a senior community, but do not need any assistance with daily living needs. In some of these communities, you prepare your own meals and do your own grocery shopping. In others, your meals are provided. Some locations have a hybrid system in which dinner and, perhaps, lunch are provided, but you are on your own for breakfast. You should check out a variety of communities until you find one which seems right for you. If you are financially limited, many cities provide senior apartments which can be rented on a sliding scale, depending on your income. You may need to go on a waiting list, so sign up as soon as you begin to think this is something you would like to do. Assisted Living Residences: These are ideal for people who do not need medical care but who might need assistance with the normal activities of daily living, such as bathing, eating, dressing, using the bathroom, walking or transitioning back and forth from a bed to wheelchair. They usually provide meals, housekeeping, transportation, medication management, and fun, interesting activities. The cost can range from about $4,000 to $10,000 a month, depending on the amount of help you need, the size of your room or apartment, and the area where you live. Long-term care insurance may help with the expense. Continuing Care Retirement Communities or a CCRC: These are sometimes called life care communities and it is something you may want to investigate years before you expect to need one. In this way, you will have a say in where you may end up living. A CCRC is composed of senior apartments and cottages which have a tiered approach. You start out living in an independent living unit. Then, as the need arises, you may be moved to a skilled nursing or memory care facility in the same community, so you can get the assistance you need while still maintaining your connections. Most of these communities require that you are able to function on your own in an independent living unit when you first move in, so it is important you plan ahead. A few CCRCs are rentals and some allow you to use your long-term care policy to cover the cost, which can vary depending on the amount of care you will need. However, most CCRCs require you to buy into the community and they will not accept a long-term care policy. The "buy-in" can range from $100,000 to $1 million, with the money often coming from the sale of your home. In addition, the monthly fees can range from $3,000 to $5,000 per person. There are different types of contracts available including unlimited life care, modified life care with limits, and fee for service, with the responsibility for expensive long-term care lying with the resident, not the facility. Before you choose a CCRC, you will want to visit all the ones in the area where you plan to live and compare whether they are rentals or the type where you pay an entrance fee, the monthly cost, potential extra fees, as well as what type of contract you will have. It can be complicated to compare them, so you want to investigate your choices thoroughly while you are still in good health and of sound mind. The benefit of a CCRC is that you can settle comfortably into one and, if you have planned well, you will never have to move again. They will take care of you for the remainder of your life. This brings a great deal of peace-of-mind to many people. Board and Care Homes: If you are looking for a comfortable, homey setting which is less expensive than most assisted living residences and CCRCs, then you may want to investigate your choices in board and care homes. They are private homes which have been converted to small senior living facilities with professional staff. They do not feel as institutional as other facilities and they can feel safer and more supportive than trying to remain alone in your own home. You will be living with a small group of other people and have a staff to make your life more comfortable. Nursing Homes: Also known as skilled nursing facilities, they will care for you and provide around-the-clock medical care. Some of them are also rehabilitation facilities and you may stay in one temporarily while you recuperate from surgery, such as a hip replacement. They have a higher level of care than an assisted living facility or a Board and Care home. If you pay for a nursing home out-of-pocket, it can average $82,000 a year or more to stay in a semi-private room, according to a 2016 National Nursing Home Survey. However, your costs may be covered by a long-term care policy or, in some cases, Medicaid. You should investigate your financial options as soon as you move into one, before any Medicare or health insurance benefits expire. If you expect to age alone, it is smart to start early to investigate your various options for receiving appropriate medical care should you have surgery or become seriously ill. If you are fortunate, you may discover you never need to use the most expensive, comprehensive care, such as a nursing home. However, if you do have a need for this advanced care, even temporarily, it is smart to know your options and consider how you will pay for it. Put your choices in writing and give the information to one or two trusted family members or friends, so you are sure your wishes will be honored, should you not be able to speak for yourself. Whether you age in your own home or move into some type of senior housing, you should make sure you have a will and trust, your finances are in order, and everything is as organized as possible. Make certain you have a trustee who can handle everything for you, should you become unable to handle things yourself. While you are at it, you may also want to consider discussing your healthcare wishes with your doctor and putting them in writing, too. A Living Will or Healthcare Directive is another way to make sure your wishes will be honored during the last few years of your life. In you are interested in learning more about aging, common medical problems, where to retire, financial planning, Social Security, Medicare and more, use the tabs or pull-down menu at the top of the page to find links to hundreds of additional articles.